Here you’ll find a comprehensive buying guide and related articles at iPupster on the subject of Dog Toys & Games. Dog Toys are one of the best investments you can make in keeping your dog happy and healthy. By encouraging your dog to play with toys, you encourage them to be active and have increased play time, which of course improves their overall health and mood. These days dog toys are available in a multitude of materials from flavored rubber materials, bone, cloth and or plush materials, ropes, balls and even artificial bones. Each has their own appeal but it's important to take certain considerations into account before choosing a toy for your dog. Our articles below provide breed-specific dog toys buying guides and reviews. We tell you what to look out for, what to avoid and make lots of recommendations and of course explain the reasons why! C’Mon, Let’s Play! What are the Best toys for Beagles? 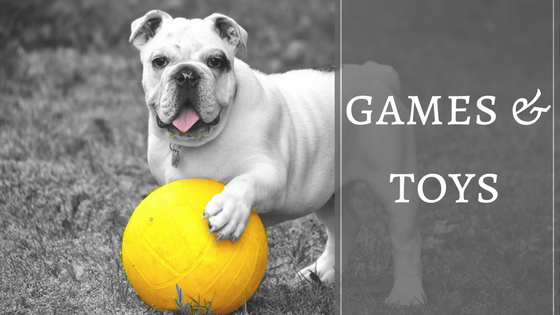 How To Pick The Best Toys for Bulldogs? The first consideration should be the size of your dog. You need to choose a toy that is designed with the size of your dog in mind. You would not want to bring a rope toy home that is designed for a Jack Russel Terrier when you own a German Shepherd. Also, consider the material the toy is made out of along with the quality of the toy. For example, if you are choosing a rope toy for a large dog, you absolutely do not want to end up with a cheap quality toy made out of plastic that your dog will destroy and chew up within minutes. Instead, choose materials that are sturdy and long lasting and directly impact the quality of the toy. You can never go wrong by purchasing a quality toy. It will last longer and it will give your dog hours and hours of enjoyment. The same is true for picking a toy for a small breed dog or a young dog. They will require a toy that is smaller, softer and easier to chew on. Be sure that you don't buy toys that have pieces that can come loose or be chewed off as these are potential choking hazards. If you are buying dog toys for a growing puppy, be sure to change out small toys for bigger ones as your puppy grows because they could choke on a toy that is too small. Here are few articles our in-house dog experts have written targeting super-smart dogs, bored dogs, toys for dogs with separation anxiety and dog toys suitable for apartment owners. It's important to note that there are smaller dogs that have quite a strong jaw and are able to chew as strongly as a large dog. If this is the case of your dog, you will need to buy heavier duty toys made for a little larger dog both for the quality and safety of the toy. For the power chewer in your life, go to: The Best 7 Indestructible Dog Chew Toys for Aggressive Chewers . Otherwise, your small dog will obliterate a toy that doesn't fit their needs and we all know how much fun it is to pick up the tiny little pieces of a shredded dog toy that's strung all over the house! You'll probably find that your dog will have one particular toy that they tend to favor. You know the one. It's starting to look a bit ragged and is beyond withstanding another run through the washer. If this is the case, you would be wise to purchase an extra one or two and put them away for future use. Because when the old one wears out, it never fails when you go to buy it again, it's no longer available. It's also important to have several different types of toys available for your dog to choose from. This way, you can mix up the play time each day for them and the games you play together. Try an assortment of everything from balls, bones, ropes, bouncy rubber toys, plush toys and anything that your dog has a preference for. Another great choice for outdoors is a frisbee. This is great exercise and fun for you and your dog. Nothing like a great game of catch and return. Most doggos prefer a golf or tennis ball but they will play with a frisbee but I know just as many dogs who prefer the frisbee. If you live on a farm/ranch don't allow your dog's inside toys to be taken outside and their outside toys to come inside. For one thing, I often buy things for outside that are intended to be thrown and are harder and would most likely break something in the house. Another reason I like to keep the inside toys inside is that it's often muddy outside, depending on the time of the year and that's the first place the dog's head to - a mud hole! LOL! One good soaking in the slop and that toy is never the same. The same goes for some of the inside dog toys. A few of them are soft and just not meant to be outside. My dogs know the rule and will drop whatever toy they have in their mouths on the deck before they enter the house. With the availability of online pet stores, you have the opportunity to choose almost any dog toy you are looking for. It also allows you to prioritize all of your dog's personalize needs and choose a quality dog toy with the exact features you are looking for. Choosing your a dog toy for your furry friend is an important task that requires some effort on your part but it can be such a fun experience for the both of you. There are so many cool dog toys available on the market today, it makes play time super fun! So choose something you can both enjoy and re-invent your playtime together. You will both benefit from the experience! I couldn't possibly talk about toys without showing you an actual video clip (less than a minute in length) of a smart pupster playing with his petite KONG. In this video, you get to see a cute Shibba Inu pup named Eevee just 10 weeks old figuring out how the treats are being dispensed from the toy. What a smart puppie! Dog Toys Topics You'd Like to See? If you would like me to cover other dog toy related topics, please do so by getting in touch with me through here. All suggestions are welcome since we would like for this to be a comprehensive and useful guide to puppy ownership.